Attracting new customers is the hardest, most expensive aspect of any business. Getting attention from your prospects, encouraging them to trust you and to take action, to do business with you, takes a tremendous amount of work. For a small business marketing nationally, it can be impossible to break through the clutter and get your message heard. However, a membership program instantly positions you as an expert in your field, making your communication welcomed by your prospective customers. It makes you a celebrity in the eye of your consumer. And, when it comes time to sell your business, you generate the sales price from your core business and you can sell your membership as well. My longtime client, David Lucca, was co-owner of an investment management firm. His firm worked exclusively with airline pilots, and he was looking for a way to attract airline pilots to become clients of his firm, versus all of the financial investment choices out there. David launched a new stand-alone company, the Airline Pilot Financial Association, to become the marketing arm of his financial management firm and provide great custom created financial resources for airline pilots across the country. I recently interviewed David for my Membership and Subscription Growth podcast. He has moved on from the investment management firm and the association he created, but what he has to share about his experience is astounding. He reports that, after starting the association, he grew his firm by over $150 million in just a few years. David shares some advice for how others can do the same. By creating a membership association, David was able to jump in front of a long line of competitors. The membership association established a relationship of trust, expertise and authority with the members. When you’re doing business in an area of heavy competition, where there are tens of thousands of other businesses trying to get in the face of your customers, this can be a game-changer. It’s easier to be an expert when you tightly refine your niche. They didn’t just narrow their target audience to pilots, but went as far as limiting it to the pilots of just 3 airlines. This narrow niche allowed them to be more specific in their message. “As soon as you speak with one voice, that process of creating value that results in a transformation is just so much easier. It’s just like instead of your brain going 10 directions, your brain just has one thing to think about. And the process of looking at their specific dangers and the specific opportunities that are in front of them, it all just becomes so much clearer as to what you can do to solve their biggest problems. Every time you go through another round of value creation, what you’re offering to your niche is more and more powerful,” advises David. No one likes salespeople. And, ordinarily, a chance meeting with someone who is looking to sell you something is not an enjoyable experience. However, everyone is excited to meet a popular celebrity. “If you try and be everything to everybody, you can’t really write a compelling message for your website or your marketing materials, because you’re trying to satisfy everybody and many of them have competing interests. But as soon as you speak with one voice to one group and they read it, and they know that you work with them, it changes everything. It makes your job easier. It makes your marketing messages more powerful. It makes their response deeper,” David says. Sell your membership together with your core business, and get paid more because you sold your marketing system as well as your core business. For businesses looking for new ways to grow, the marketing platform of a membership model is certainly one to consider. When you create a narrow niche in the market, it allows you to really get to know more specific needs and desires of your audience. When you’re seen by your target audience as an expert, a celebrity of sorts, you will gain them and keep them as a client in your business. All that with additional income to look forward to when you choose to sell! 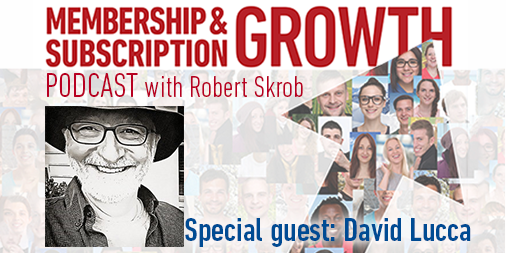 To discover more insight into this unique marketing platform, listen to the full interview with David on the Membership and Subscription Growth podcast.